A LITTLE part of Inner Mongolia comes to Aldershot next week, via the voices and instruments of ten-strong band Anda Union. 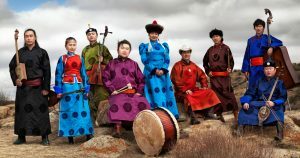 With music that draws from all the Mongol tribes that Genghis Khan unified, Anda Union fuse a wide range of musical instruments and vocal styles. They combine throat singing and long song with horse-head fiddles and two-strong lutes, and they’ll do it all at the West End Centre on Friday 8 June.